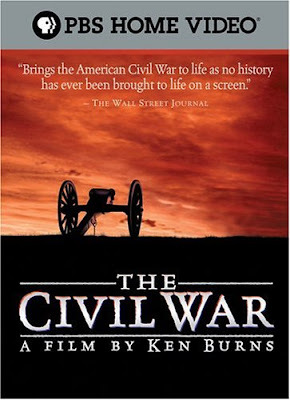 The Civil War is an acclaimed documentary film created by Ken Burns about the American Civil War. It was broadcast on PBS in September 1990. Forty million viewers watched it during its initial broadcast, making it the most watched program ever to air on PBS, to this day remaining one of the most popular shows broadcast by PBS. The documentary is 11 hours in length, consists of nine episodes and makes extensive use of more than 16,000 archival photographs, paintings, and newspaper images from the time of the war. These are intermixed with contemporary cinematography, music, narration by David McCullough, anecdotes and insights from authors such as Shelby Foote, historians Barbara J. Fields and Stephen B. Oates, and a chorus of voice acted characters such as Sam Waterston as Abraham Lincoln, Jason Robards as Ulysses S. Grant, Garrison Keillor as Walt Whitman, and Morgan Freeman as Frederick Douglass, who read quotes from the historic figures of the period. The film was remastered on the twelfth anniversary of its release, and a book following the movie has also been released.